Help your guests catch the Aloha Spirit! 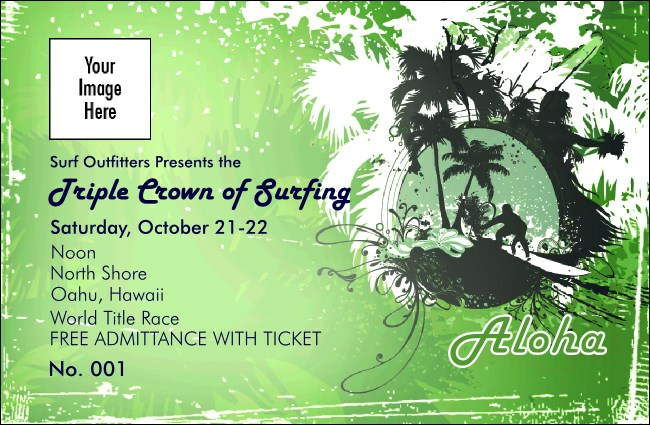 A surfer coasts on a wave against a green backdrop of palm trees on this Aloha Drink Ticket, which features a space for you to personalize the ticket template by uploading your own custom logo or image. When you sell more drinks in advance, your guests can hang loose and enjoy the celebration! Dip your toes in an ocean of publicity materials with TicketPrinting.com.